Is this not available in the v8.1.4 UE4 Subscription Edition? Thanks! 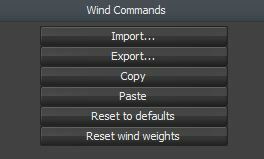 Resetting the Wind to default is no longer available in v8. However, the better course of action would be to run the Wind Wizard and then tweak the settings to get your desired result. Hmm that's unfortunate that it was removed - it doesn't seem like the Wind Wizard and its limited options can get the wind back to 'normal' after a bunch of changes are made to the fan properties. Thank you for your reply though!